Used 1971 Plymouth Cuda Sold in Indiana PA 15701 AutoSport Co.
For sale is a Rotisserie Restored 1971 Plymouth Barracuda with a Hemi! This car has received a high end complete nut and bolt rotisserie restoration. It has been finished in Plum Crazy Purple w/White Billboards and a White interior. The Plum Crazy Purple is Show Quality in excellent condition. The body on this car is in excellent show quality condition, its rock solid with no rust! The white interior is show quality as well and is bone stock, w/ buckets and the iconic pistol grip gear shifter. All the gauges are stock and work well. Under the hood is a real deal 426 Hemi engine that has been professionally built with a 2x4 Carburetor set up just like they did from the factory. The drive train is correct and works great with this massive big block Hemi engine. The engine compartment has been restored period correct with right air clean and shaker hood. The Chassis is stunning under this car! As you can tell by the photos the body on the undercarriage has been painted to match, the frame is perfect, the exhaust is a huge 3’ dual exhaust. There has been no expense spared building this beautiful Hemi Cuda and once you turn the key on you instantly realize you are not operating your average grocery getter with close to 600 heart pounding horses vibrating your inner core! Please feel free to call us at 814-977-9219 or email us with any questions. 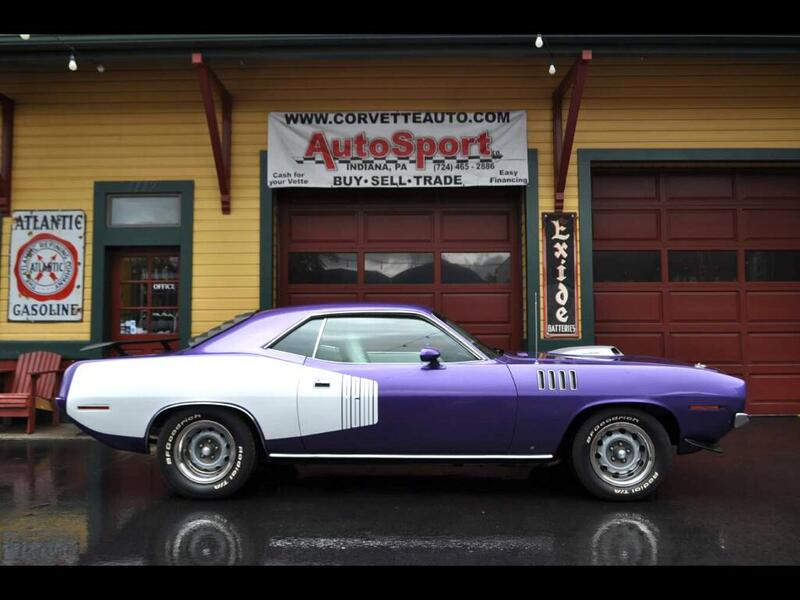 Vehicle Inquiry for 1971 Plymouth Cuda Plum Crazy Purple 426 Hemi Cuda!